Squeaky Books: Korean Speaker Needed! Help! I know this is one of Shannon Hale's books, and I think it's Enna Burning, but all my searches have been inconclusive and the translations don't make sense. If you speak Korean, can you tell me what this means? *sigh* Yup. When I translate it I either get that or "The Girl who Reads." Neither of which makes sense to me. The cover is very Forest Born-y, too. It's beautiful! The direct translation is the Lynn the Girl Who Reads Feelings (or Emotions). You might be able to interpret it as the girl who reads hearts or the girl who reads minds. Oh and one more thing, yes, the book is by Shannon Hale. 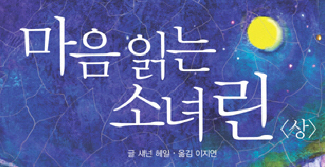 It was in very small print, but the image has the author's name written in Korean below the title. I think "Mind Reading Rin" is right. I am Korean!